After a boy has completed the fourth grade and earned the WEBELOS badge, the next step on the WEBELOS trail to becoming a Boy Scout is earning the Arrow of Light Award. 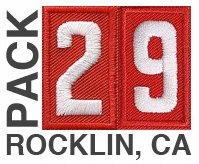 This is the highest award a Cub Scout can earn, and is the only Cub Scout badge that can be worn on the Boy Scout Uniform. It's tougher to earn than the WEBELOS badge. The Cub Scout will have to earn the Webelos badge and at least eight activity badges, including Citizen, Readyman, and Fitness. The total must include one from each of the five activity groups.